Manufacturer & Exporter of Industrial Components. Our product range also comprises of Valve Trims, Valve Disc. We are one the well-known manufacturers and suppliers of Ferrous and Non Ferrous Ring Holders. The offered o ring holders are components of the butterfly valves. Our supplied o ring holders are highly acclaimed and liked for smooth operation in fluid environment. 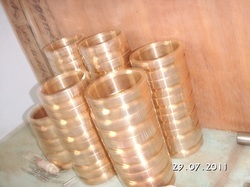 The offered o ring holders are highly liked by the clients, due to the easy installation and durability. Looking for Industrial Components for Petroleum and Gas valves ?